Tonite is the MLB All Star game. Today is the release of EA Sports NCAA 10. I can’t really explain how much more I am pumped for the latter than the former. The MLB All Star game is, in most cases, boring. It drags on and no one is in the game long enough to make a major impact. I can’t tell you the last time I watched more than 3 consecutive innings of an All Star game. 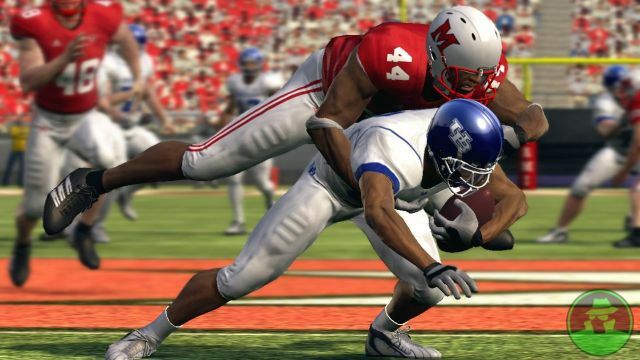 EA Sports NCAA Football franchise is another story. I have bought the new game every year since 2002 and have never been let down. They introduce something new every year and the graphics just keep getting better. This year’s edition will include a revamped Road to Glory mode that will include none other than ESPN’s resident smoke face: Erin Andrews-DiLo. She will give the user updated stats analysis throughout their college career. So which will you be doing? Will you be engaging in eye glazing baseball or will you be on the sticks getting after EA (by EA I don’t mean Electronic Arts)? It is safe for me to say that the MLB has no shot at getting my attention tonite. You are currently browsing the archives for the NCAA 10 category.